If you want to spend some time on a really Greek island in the Cyclades this should certainly be on your list. 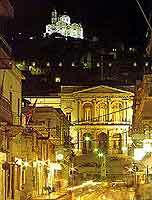 Syros is one of the smaller of the Cyclades islands. It is 22kms long and 9 kms wide with an area of 86 squre kilometres. However, because it is the capital of the group, its largest town, Hermoupolis, is in fact the largest town in the Cyclades with a population of over 13,000 people. The island does not attract a lot of tourism. While the island does not have a lot to offer, the town of Hermoupolis does. Better still, because it is not a tourist resort, the island still retains a very strong Greek feel to it. 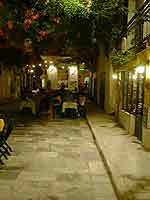 For example, the cafe-bars around the harbour fill up with young Greeks rather than young tourists in the evenings. And if you are a foreign tourist you can wander the streets without coming across more than a handful of other tourists. What a change after islands like Mykonos and Santorini. The town can roughly speaking be divided into four areas. On arrival the first area you encounter is the harbour, lined as it is with cafes, bars and shops. Behind that is the main shopping area together with the administrative and cultural centre of the 19th century town. It is very pleasant to wander around the streets behind the port area, window shopping and stopping off for a coffee at one of the many cafe-bars. The town hall square is also very pleasant in the evening when it fills with children whose parents sit at the cafes that surround the square. Behind the administrative centre two hills rise above the town, both of them inhabited. To the right is the hill called Vrontado. This is the Greek Orthodox town which developed after the War of Independence. At the top of the hill is the church of the Anastasis. From here there are fine views of Tinos and Mykonos as well as of the the 19th century town and the harbour below. To the left, further inland and higher than Vrontado is Ano Syros, the medieval Venetian town where most of the island's Catholics live. The Church at the top of this hill is St. George. This Ventian town is far more attractive than the more modern Vrontado. 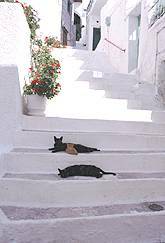 The climb to Ano Syros up 800 steps is extremely taxing and not recommended on a hot day. Buses run round the back of the hill and drop you off near the top. Taxis are also a cheap alternative. At the top of the hill is the Catholic Catheral of St George, founded by the Venetians, and the Monastery of the Capuchins, founded in 1635 by Louis XIII of France. The presence of this monastery under French protection saved the island from the Turks and gave it a de facto neutral status. 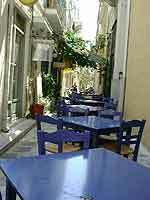 The streets of Ano Syros are very picturesque and there are a couple of tavernas with a fine view across the town to the harbour and beyond which make a pleasant setting for an evening meal. There is also a memorial to the rembetica musician Marcos Vamvakaris, who was born in Ano Syros. The speciality of the island is loukoumia, which we call Turkish Delight. A number of shops sell this in a variety of flavours , including in mixed boxes so that can give all the flavours a try.